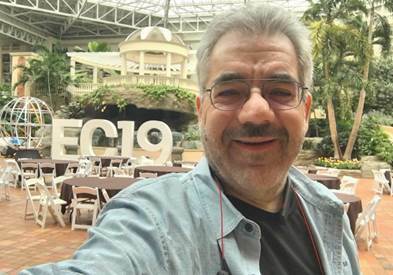 Greetings from Orlando where Enterprise Connect 2019 just concluded. This conference – a bit more for industry people and analysts than for end-users – certainly marked a transitional period for our industry. Over the four days of the event there were a lot of elements of this change to take note of. 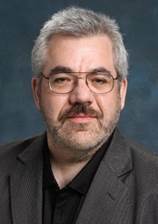 As I’ve done for conference wrap-up blogs in the past, I’m going to split the task of authoring this one with my friend and industry colleague, David Maldow. David, the founder and president of Let’s Do Video will cover the individual exhibitors as part two, and I’ll be reviewing the major themes to come out of the conference as part one. Part of my reason for sharing the duties is my own transition. While I’m still the Director of Emerging Technology for the IMCCA, a blogger, vlogger and editor of industry publications –and prefer to still classify myself as an “analyst” –I’ve left my day job at an integrator and joined the team at Poly (the firm formerly known as Plantronics / Polycom – more on that renaming later.) While some may legitimately question how I can be an analyst and work for one of the firms in the industry, I would reply with the explanations that Poly’s leadership has empowered me to maintain an independent voice in the space (to the extent that I can); I’ve worn multiple hats in the industry for years and have always maintained the required integrity and impartiality (and see no reason to stop that now); and finally, if you think all of our industry analysts aren’t “paid” by the manufacturers, you really must not be paying attention – I’m just doing it out in the open. While I’m very comfortable speaking to the keynotes and the trends and themes revealing themselves to our industry, I’d best not comment on the individual exhibitors / competitors, as there are certain ‘sensitivities’ amongst some firms that I’d rather not exacerbate. · AI: Most attendees were very interested in how artificial intelligence and machine learning would change what we do. There were a small number of sessions and one keynote from Cisco that addressed this directly, but from the questions asked in the sessions and the manufacturer’s exhibits it was clear that this is something everyone is hyper-focused upon. Whether it’s to help in retrieving appropriate background for sales and support calls, help manage inquiries automatically, help support voice control of systems or just generally work at improving the user experience, AI will clearly play a large role. Look for more session focus on this topic at future events. · Frictionless: The users that attended made it very clear – in their questions and comments – that there is still too much in their way preventing easy meetings. 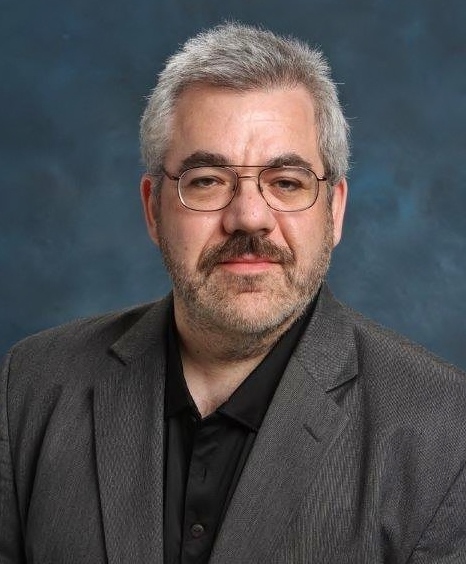 While many of the manufacturers and service-providers have made it easier to connect on their systems and platforms, at the same time they’ve made interoperability an even bigger monster – and users are fed-up. (It’s hard to believe that in 2019 we’re still legitimately complaining about interoperability.) “We just want it to work” is the clearly the continuing user mantra. · “One size”: I can’t even count how many times speakers and attendees repeated the phrase “one size does not fit all.” This is clearly a backlash against manufacturers and service-providers that say the solution to all the problems in the world is using their system or platform. Users were loud and clear – regardless if the topic was cloud, soft-phones, platforms or team-chat – every tool/platform/device being offered is not appropriate for every user application. · Team-Chat: It was interesting to see how much of last year’s hype around that subject has died down. If you recall – at Enterprise Connect 2018 – just about every keynote addressed the fad. This year, for the most part, Microsoft was the only vendor still emphasizing team chat in their “Teams” platform. I personally believe the reason for this (as I’ve stated before) is that team chat / persistent chat platforms just do not scale well for large enterprises. They are a fabulous tool, but only really appropriate when you have a small-ish (~5 to ~50) team of people motivated to engage on the topic at hand. When you try to use it for hundreds or thousands of people it loses much of its power to improve productivity and increase engagement. With larger numbers of users it is likely that you will have a percentage of non-motivated individuals that will require “chasing” to contribute to the tasks, doubling the workload in any necessary parallel effort. I like “teams” and use it daily, but IMHO it is one of many collaboration tools in the toolbox, not the single one that we’ll all be using in the future. · Democratization: Regardless of any competitive disagreements, it was clear that costs of collaboration are dropping substantially. Service providers have more competition which drives costs down, there is an explosion of room collaboration platforms that work off of general compute platforms – which drives costs down; and manufacturers are building new peripherals and appliances for a fraction of what they used to cost. The result of this is collaboration is growing at a much faster pace and with a much greater ability to scale than ever before. The “video is the new voice” mantra of many years ago may actually come true. · WebRTC: Ok, I’m just throwing this one in for the requisite groan. (Bla, bla.bla…..WebRTC will be how everything will interoperate in the future….bla, bla, bla…It will revolutionize collaboration…..bla, bla, bla….everyone will eventually adopt the same standard….. bla, bla, bla.) Yes, there were still a few people that were actually still chanting this at the conference this year. Maybe it will eventually be great or maybe it won’t, but as I’ve been saying for many years, don’t hold your breath. Interoperability is something our industry could have today if the manufacturers and service providers really wanted to do it. Saying ‘it will be there in the future, but only when everybody else adopts the standard that I’ve chosen’ is transparent enough to be seen for what it is. There were a number of good keynote presentations this year. For the first time in a number of years, none of them were downright embarrassing (no shorts, no silly conversations with one end user, no cupcakes.) In my opinion, for the second year in a row, Microsoft Clearly presented the best one. 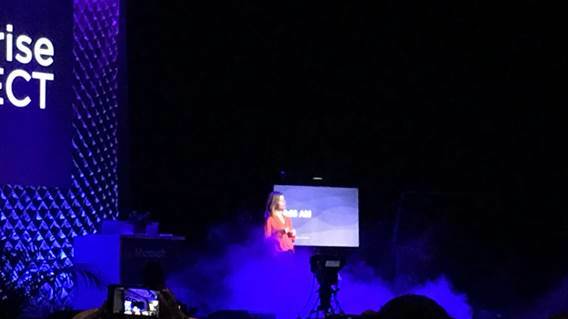 Lori Wright, Microsoft’s General Manager of MS 365 anchored an interesting and engaging presentation and demonstration, which for the most part wowed the audience. Before I give her the deserved credit, I have to ask (as everyone else who attended did) what the heck was with the smoke she used as she entered? It was a totally inappropriate and unnecessary stage effect that led to a number of jokes: Where were the mirrors? Who is Microsoft trying to hide from? The Wintel processors are running so hot to deliver the needed performance they’re burning up? Etc. The heart of the presentation was not nearly as silly. 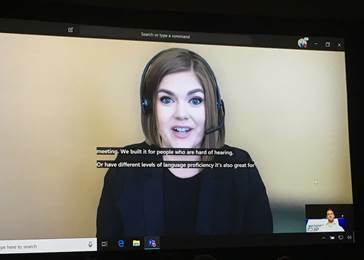 MS showed a number of exciting features – including real-time captioning of video calls (in case you need to take them in noisy environments and don’t have a good headset) and mobile first extensions that are targeted to specific verticals. 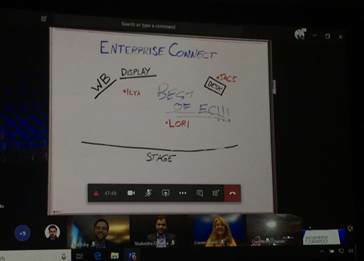 MS also joined the handful of manufacturers that are supporting camera pick-up of standard whiteboards for transmission down the data channel to remote meeting participants. As one of the providers of an expensive Interactive WhiteBoard (Surface Hub 1/2) and even showing a partner’s IWB (Avocor) right on stage next to the whiteboard demonstration, it tacitly raised the legitimate issue that most general use applications will not require these expensive devices any longer – so it was weird to reconcile that mixed message. 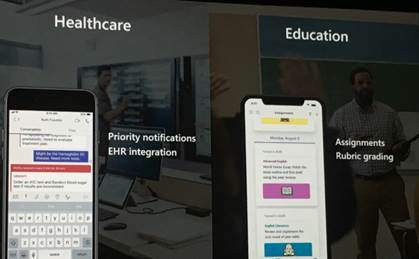 For the most part however, it hit all the key parts of a great keynote – including showing actual new features actually working that people can use. Cisco’s Amy Chang delivered their keynote the following day. It was essentially a slick presentation of their concept of “Cognitive Collaboration” meaning how AI will support the merging of real-time data in collaboration applications and contact center / sales environments. Those who had not seen the presentation before said they were impressed by the theme. 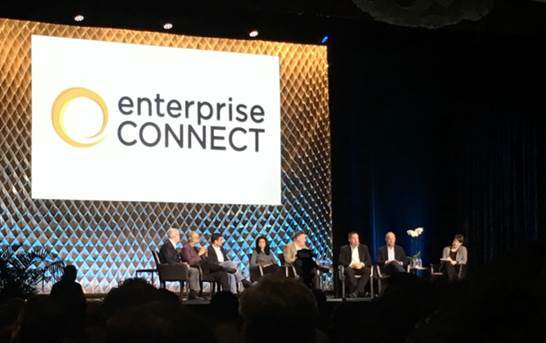 Those who had been to prior Enterprise Connect events and Cisco events from earlier this year were far less impressed. It was a keynote made up of high-level themes and slickly produced videos, but little actual functioning product / service. The product demo that was provided first erroneously claimed that wide-angle cameras from their unnamed “competition” can’t correct for wide-angle fish-eye effects (which isn’t true for most), and then showed a Room Kit Mini that automatically recognized the speakers and superimposed their names on the screen. 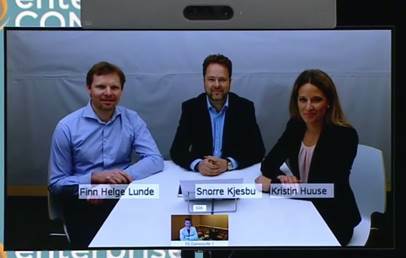 It was just a duplicate of technology we saw one and even two years ago from Cisco at this event (see above) when Snorre Kjesbu was one of the remote participants identified. 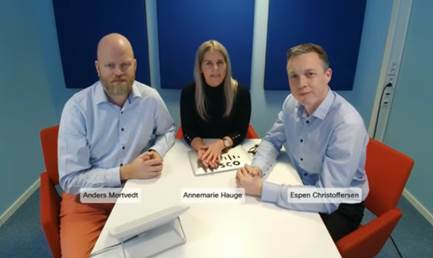 Snorre (and much of the heart and soul of Cisco’s collaboration team) has left the firm, and their replacements have yet to show that they even understand this industry. The other keynotes I attended – From Walmart, Amazon and Google – were essentially ‘here’s what we do and here’s how we do it’ presentations. Interesting, but not really what I believe most people attend the keynote sessions to see. Instead of that high-level messaging I really would like to have seen those firms show the attendees how they could use either new or existing features / services to improve their collaboration needs. WARNING – BRAGGING SECTION: I do have to recognize my team, the former Plantronics / Polycom firms now combined into our new firm called “Poly” as having a terrific presence and performance at the conference. I’ll let my friend David Maldow go over the products and details he saw, and tell you about how our Studio device won the best product at the show award, but as for the rebrand – it was everywhere – on benches, escalators, lunch counters – you name it. Poly means many, and our firm will lead the way in showing how the power of many will change the way we communicate and collaborate. Click the new logo (called the Poly Propeller) below if you want to see more of the new story. That’s it for Enterprise Connect 2019! 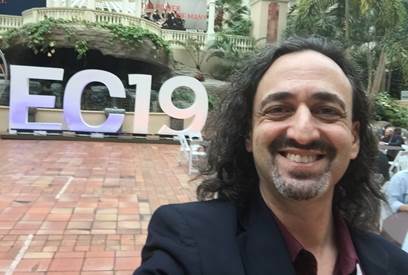 Look for my next View From The Road from InfoComm 2019 in June. As opposed to the last number of years, the IMCCA and I are not at all involved in the planning and vetting of the UC track or Emerging Trends day there, as Avixa preferred to handle those tasks internally rather than use an industry accredited group like ours to ensure the quality and value of the presentations. We wish them well as they plan an exciting event. The Spring issue of Sound and Communications IT/AV Report will be available at that conference – the first complete issue that I’ve personally edited myself. We’re putting it to bed as I write this. It is themed around emerging technology, and it’ll be full of some great articles on Team Chat, Data Lakes, Bluetooth, The Changing Corporate Office Floorplan, and will include an engaging and timely Viewpoint debate on general compute vs. appliances for room collaboration. It will also have a few opinion columns from industry analysts and myself on the directions our industry and associations are taking.